PLYMOUTH — It had been the better part of a decade since Wawasee wrestling last won a sectional championship last year. On Saturday, the Warriors backed it up with a repeat title in Plymouth, and they made it look pretty easy. The defending champs scored top-five finishes at every single weight class, advanced 13 to next week’s Penn Regional with top-four placements, made eight finals and secured four individual titles on the way to 263 points and repeat championship honors. As it did last year, Culver Military Academy settled for second best behind Wawasee with a 227.5 score, while Warsaw placed third with a 171.5, Tippecanoe Valley finished fifth with 157 points, and Triton was seventh with a score of 52. It wasn’t particularly surprising who the Warriors’ closest competitor was. 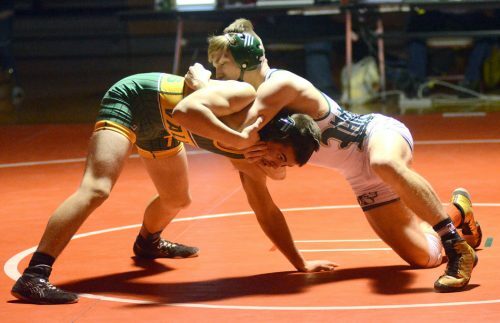 After all, it was CMA nipping at Wawasee’s heels at last year’s sectional, and it was the Eagles who handed the team its first loss this season in a home dual back in November following a 10-0 start by the Warriors. CMA out-did its rivals in terms of individual hardware as the Eagles claimed a total of six championships to Wawasee’s four. But CMA failed to score at a total of three different weight classes, while the Warriors collected top five finishes everywhere Saturday. Wawasee’s Braxton Alexander hits a front headlock against Valley’s Jacob Eherenman in Saturday’s 138-pound final. Six of Wawasee’s championship bouts came in head-to-head action against the Eagles, and the Warriors won only two of those. 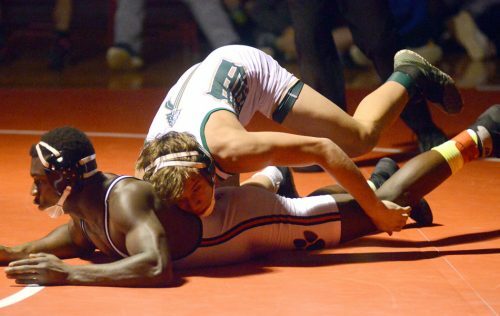 Geremia Brooks cruised to a 1:23 pinfall over CMA’s Alex Coleman at 132 pounds, and Alex Castro scored a thrilling, 3-2 decision against Alex Donahue in the 82-pound finals, handing the Eagles freshman his first loss of the season. Castro scored an escape early in the second period, then rolled Donahue on his shot with around 30 seconds to go to open up a 3-1 lead headed into the third period. It was Donahue who scored an an escape early in that period and he nearly scored on a shot with time winding down, but Castro was able to defend until the final buzzer to give his team its fourth and final individual title of the day. Brooks’ title was Wawasee’s first of the day, and he, Braxton Alexander and Garrett Stuckman rattled off three straight championship victories from 32 through 45 pounds in Plymouth. Following Brooks’ first-period pinfall of Coleman, Alexander opened up a 7-2 lead over Valley’s Jacob Eherenman before throwing him early in the second period for a pinfall at the 2:37 mark of the match. Stuckman couldn’t quite finish Warsaw’s Jacob Bass but kept the pressure on for a 12-4 major decision at 145 pounds to give his team a third straight championship. Garrett Stuckman controls Warsaw’s Jacob Bass in the 145-pound final. The Warriors made the finals at four other weight classes as Dylan Tom finished second at 106, Jace Alexander was second at 120, Damien Rodriguez was runner-up at 195 pounds, and Isaiah Tipping finished second at 220 pounds. Landen Dilley (113), Isiah Faurote (152), Logan Baugh (160), Fernando Hernandez (170) and Haegan Slusher (heavyweight) all made the top four cut to next weekend’s Penn Regional, Slusher and Faurote each winding up third Saturday. The only Warrior who didn’t advance was at 126, but Brenden Dilley still scored points for his team with a fifth-place result Saturday. With 13 still alive in the tourney, Wawasee is gunning for its first regional championship since 1998 at Penn next Saturday. While Wawasee and CMA battled for the team title a second straight year, Warsaw’s young lineup snuck up on some teams with a third-place result. A total of eight wrestlers advanced for Warsaw, 12 scored points, and four made the finals. Warsaw’s Jose Grimmett and Valley’s Jon Hume lock hands in the 152-pound championship. Bass, Jose Martinez (112), Brandon Estepp (160) and Jose Grimmett (152) all made the finals at their weight classes. Grimmett was the lone Tiger to top the podium, however, beating Tippecanoe Valley’s Jon Humes via narrow, 2-1 decision in the 52-pound finals. Grimmett scored a reversal midway through the second period to grab a 2-0 advantage over Humes. Following a trio of blood stoppages in the third period, Grimmett was deducted a point for stalling with 10 seconds left to wrestle, but he held on for the win, avenging a late pinfall loss to Humes on senior night in Warsaw last month. Andrew Ross finished third at 120 pounds, Isaiah Owens was fourth at 126, Brock Hogenson was fourth at 132, and Brock Hueber finished fourth at 195 pounds as Warsaw advanced eight to the Penn Regional. Austin Brown (138), Jayton Brock (170), Angel Mendez (182) and Griffin Reed (heavyweight) all finished fifth as the Tigers scored in every weight class it entered. Five Valley wrestlers punched their ticket to the regional round, meanwhile. Triton’s James Snyder attempts to roll Warsaw’s Brock Hueber onto his back in the match for third place at 195 pounds. Drake Montelongo scored a 4-2 decision over Martinez for the 113-pound title, while Humes and Eherenman each placed second for the Vikings. Branson McBrier was third at 126, and Brandon Hammer was third at 170 pounds. Haley Hoover (106), Hunter Eherenman (120), Dakota Gaff (145) and Joel Ordaz-Cisneros (160) each finished fifth, and Luis Castillo (132), Skyler Losher (182) and Tyler Nine (220) each placed sixth at their weight classes. Three Triton wrestlers advanced to Penn as Connor Pitney and Billy Smith each finished fourth at 138 and heavyweight, respectively, while Snyder finished third at 195, losing an 11-8 decision to Damien Rodriguez in the semifinals, then wrestling back with pin call wins over Culver Community’s Isaac Walters and Warsaw’s Hueber. Aaron Stichter finished sixth at 220 pounds for Triton, which entered only five wrestlers at Saturday’s sectional. Northridge barely held off Jimtown 235.5-232.5 for a second-straight team title with a at the Memorial Sectional, while NorthWood finished fifth with a 114 score Saturday. Jake Lone won the Panthers their only title in Elkhart pinning Memorial’s Alexander Ploner and Goshen’s Jude Fitzgerald before rolling to a 9-1 major decision over Jimtown’s Henry Gratzol in the 182-pound finals. Tyler Becker finished third at 160 pounds, and Jaden Miller was second at 170 pounds as NorthWood earned back-to-back finals berths. Also for the Panthers, Alex Walker finished fifth at 138, Noah Alexander was fifth at 195, Geronimo DePauli was fifth at 220, and Isaac Benjamin finished fifth at heavyweight. Ethan Rogers placed sixth at 152, Trey Tobias was sixth at 145, and Sam Schutlz was sixth at 106. Lone, Miller and Becker all advance to the Goshen Regional next Saturday.